Tell us about your plans and share some details about the flat pack or custom-made furniture you wish to buy. We will calculate the cost for the service, based on the total value of your furniture purchase order. Then, schedule your furniture pick-up and delivery service for as early as the following day. We have various delivery slots available after 12 p.m. for any day of the week, including bank holidays. A representative from the furniture delivery company will request you to forward your shopping list to us, so we can double-check the stock availability for your selected furniture items. Note that we will need the funds for purchasing the furniture on your behalf promptly upfront. On the day of your furniture delivery, the movers will visit the chosen retailer in London and hand the order list to the in-store staff. Then, your pieces of furniture will be loaded carefully into the van. The movers will ensure the safety of the furniture during transportation by securing it with a rope and padding materials. For large furniture pick up and delivery orders such as Ikea collection, we send the furniture removers to the store a day before your delivery appointment, so they can make sure that everything goes to plan up until the Ikea home delivery to your address. The furniture delivery company transport the furniture to your address in the afternoons due to the relatively late opening times of most popular furniture retailers. Your furniture will be unloaded with care and with your new pieces’ integrity in mind. You can also take advantage of our additional assistance and have your flat pack furniture assembled, as well as old items disassembled and removed from your property. With us, you can often arrange a same-day or next-day service. It's a subject to availability but you can easily check our Prices & Availability and make a convenient booking. Plus, we are available on weekends and even during official holidays. We can collect and deliver most types of flat pack furniture from brands like IKEA, Habitat, Homebase, Asda, Argos, Peter Jones, Mamas & Papas, John Lewis and many more. A sofa pick up and delivery for instance, is an easy task for our furniture delivery experts. They are diligent, vetted and fully insured. They are experienced and equipped to handle various furniture delivery tasks to save you time and effort. You only need to spend a few minutes online to choose the furnishings you wish to buy and leave the rest to the reliable Fantastic technicians. If you wish to assemble your new furniture on your own, that's fine. But if you just want to enjoy it as fast as possible, then we can give you hand. The technicians can assemble any type of furniture, from any brand. They've got all the necessary tools and you can expect a neat job. You can now try out our Fantastic Club to get an annual discount of 10% across all services we offer, including on furniture collection and other removal services. You will also enjoy a preferential booking experience, and can also take advantage of our discounted services everywhere you go with our GoFantastic app. We can save you some valuable free time by providing you with convenient furniture collection and delivery solutions from any IKEA store. With us, you will not need to leave the comfort of your home to pick up your items nor will you wait for days for the load to arrive if you choose the store delivery options. With us, your Ikea delivery is finished with no hustle at all. Just browse the IKEA's website to select the flat pack pieces of furniture you fancy and add them to your shopping list. Include the unique product number and ensure that they are available in stock at your nearest IKEA store. When you’re done, save the list and send it to us. This is an essential information that is required for a smooth Ikea pick up service in London. We will dispatch a team of reliable furniture movers on the following day to purchase for you the items on the list. 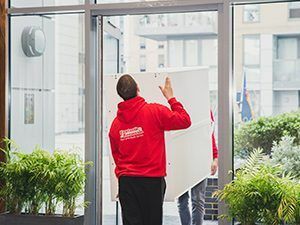 They will load them securely into the van and transport them to your address anywhere within the M25 zone that very same day, ensuring smooth and trouble less furniture delivery service. You can also order our furniture assembly assistance together with your furniture pickup and delivery service and have all your pieces put together by the skilled technicians. The Fantastic furniture removers will bring all the tools needed for the job and install your items according to the assembly instructions. The movers will go to the store of your choice and will buy and load in the van whatever you have told us. If something is out of stock, it won't be delivered, so make sure it's available before sending your list of furniture to us. Keep in mind we only do deliveries after 2 p.m., because the team needs time to pick up the items and transfer them to your property. Keep in mind that we can deliver not only furniture but all kinds of items from IKEA and other stores. Whatever fits inside the moving van will be delivered at your door. Benefit from our professional furniture assembly services and get a discount. Fantastic Removals is always interested in giving you the best value for the price. Q: Can I book a same-day furniture delivery? A: We can only manage next-day furniture courier services in London, due to the late opening times of some of the popular retailers, as well as due to the furniture collection process, which takes time, too. Q: I’ve ordered a whole kitchen to be collected and delivered from IKEA. Can you help with the installation? A: Yes. Make sure you notify us about your additional assembly needs in advance, so the technicians can bring all the power tools required for the job. Q: Do you deliver garden furniture from B&Q? A: Yes. Just ensure that your local B&Q store has the goods in stock, send us the details and we’ll handle it from there. Q: I’m a small furniture retailer myself. Can I book your furniture pickup and delivery company to transport goods to my customers in London? A: Absolutely. We are a removals service provider, which offers a wide range of moving solutions, including commercial removals, boxes delivery and packing prior to transportation, as well as man and van services. On that note, all regular business customers enjoy our services at preferential rates. Q: Could you do the online shopping list for me if I let you know what I want? A: No, we can't do this. We will handle everything for you but you need to create your own shopping list first.